Whilst driving back from a day out at Betws-y-Coed with my flatmate Karla, we decided to be spontaneous and walk to Llyn Idwal, after much debating. Unfortunately because we were so spontaneous we didn’t have any proper walking boots, so we were slipping and sliding on our way up to the lake. 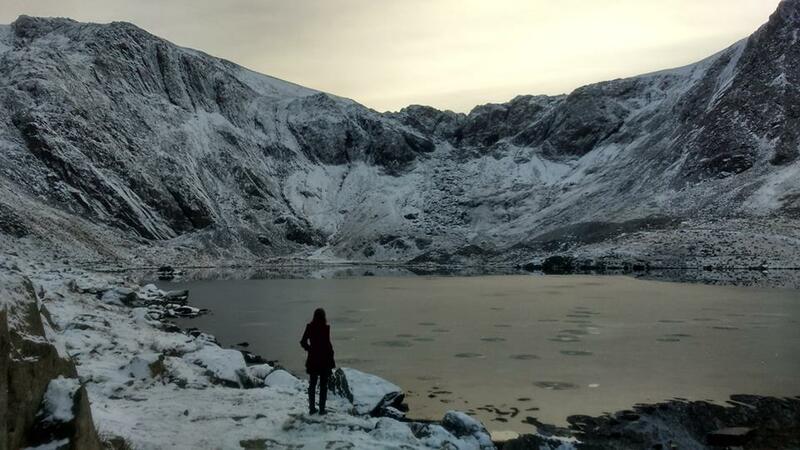 But once we reached the lake we were amazed to find this beautiful view, with Llyn Idwal frozen over. A real treat and one I’m glad we didn’t miss out on. Don’t forget to follow me on Twitter, Google+ Facebook, Pinterest and Instagram for more photos and updates. Or Follow my blog with Bloglovin. I love high mountain lakes. They’re like shining gems. This beautiful photo also has so much atmosphere, well done! Ohh… and thanks for visiting my blog. I hope you find the posts on philosophy, aesthetics, Asia, and whatever else useful. The intellectual life and walking are one and the same… contemplation of the various aspects of reality while wandering. Aristotle is said to have wandered around as he taught, while also wandering through Athens engaging the locals in philosophical conversations/debates. Breath taking. I am so glad you did the trek and captured this beauty to share. Thank you.